Survey: Share your opinion of the future of telemedicine. 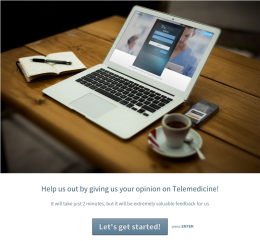 Take our 2 minute survey and share your thoughts and opinions about the future (or lack thereof) of telemedicine! Telemedicine is gaining at least a toe-hold in health care at both ends of the health care spectrum. For some large hospital groups and insurers it offers an ability to scale with significant cost savings, and on the other end individual physicians like those in concierge and cosmetic practices are using telemedicine to stay in touch with patients and offer services on-demand. If you're a physician, clinician or clinic/hospital administrator, we're asking you for a few minutes of your time to take this survey an answer a couple of simple questions to see what providers are thinking about telemedicine. We'll aggregate the answers and create a report outlining the sentiment of physicians and other providers around telemedicine.